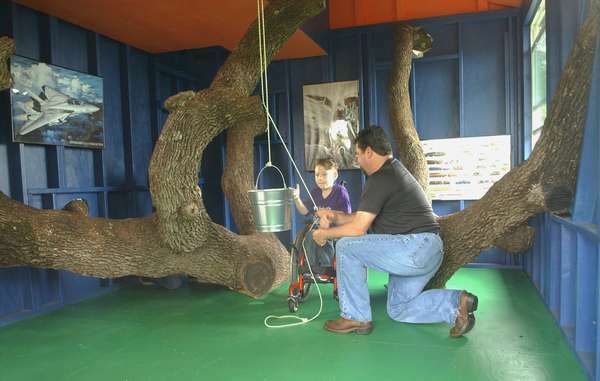 Hayden Trigg, 7, takes a tour of his wheelchair-accessible tree house on May 17, 2016, built through a partnership of Austin Tree Houses and BioTrust Nutrition and Make-A-Wish. A 7-year-old Austin boy finds happiness in planes, trains and the ability to roam about on his own. But, for the entirety of his life he has been bound to a wheelchair, which inhibited playtime with friends, until his wish was granted by a few Central Texas supporters this week. Hayden Trigg has been diagnosed with spina bifida and hydrocephalus, a neurological order. He already endured numerous surgeries and has a “lifetime” of procedures to come, his mom Adrienne Trigg told mySA.com on Thursday. “This particular year was very rough for Hayden, he was hospitalized for three months,” Adrienne Trigg said. 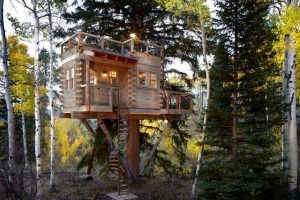 Hayden’s mom said the boy had been yearning for a tree house for more than a year after watching an episode of Discovery Channel’s Treehouse Masters. The family contacted the Make-A-Wish foundation to get the ball rolling. “I thought it (the wish) would have been a lifetime supply of chocolate,” Adrienne Trigg quipped. With the generosity of two Texas companies, Austin Tree Houses and BioTrust Nutrition, and the Make-A-Wish Foundation, Hayden Trigg is kicking off his summer vacation with a club house designed specifically for his needs and big enough to fit his entire first-grade class. All of Hayden’s classmates showed up to watch him and Austin Tree Houses owner, Rob Soluri, cut the ribbon on the Trigg’s new digs on May 17. Adrienne Trigg said her son’s reaction at the unveiling looked as if he had won an Academy Award. Soluri said Hayden was “literally shaking with joy” when he saw the finished product. 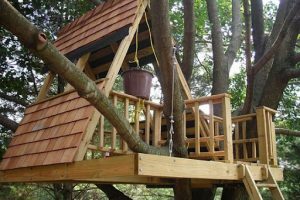 The mother said her son has played in the treehouse every day since Tuesday and it has also provided a change of scenery for his therapy sessions, she said. 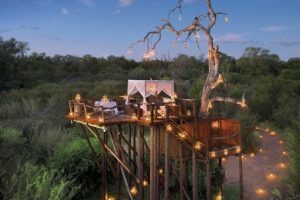 Constructing the ADA-complaint tree house, which would usually cost about $50,000, was an “honor” for Soluri, he said.